The more I watch this episode the more I like it. It is of course very different to see Arthur, Ray & Dave outside their London domain but I just can't help but like it. This one feels very much like a 'Minder on holiday' episode and I am happy that with the booze cruise angle, Dave comes along too. The scenes in the prison cell are priceless as Arthur realises he can't talk his way out of jail this time. The booze cruise idea was popular at this time. I remember there was a cheap booze outlet in Calais called 'Eastenders' which used the same logo as the BBC soap. While trawling Google Maps hunting for locations I came across it and it is now in a very sad state of disrepair. The love interest for Arthur is interesting too - occasionally this pops up in the series and is funny to watch as he could never be with anyone but 'er indoors of course. I have visited all of the Calais locations found so far for this one in the past few years and it if you go there it feels great to be where our heroes were 'across the channel'. I stumbled across the warehouse where the robbery took place by total accident and this is not far by car from the station at the end of 'Minder On The Orient Express', all outside the town towards Guines. There is no punch up for Ray admittedly and his French speaking skills don't seem to have developed much in this one since we heard about them back in series 8 but it has become one of my favourites from the Ray Daley years - overall 8/10 from me! I loved the scene with Arthur and the sailor in the police cell and Arthurs line about "being out of here before they (the French) have finished their morning co-co!Daves Comments to Ray about Arthur doing tim ein either a French or English nic is calssic as he says "perhaps they will meet half way, there is that big prison on the isle of wight!" CLASSIC! Totally agree - there is usually always at least one quote that sticks out for me in an episode, but there was loads in this one - 'one man's coq au vin is another man's chicken in a basket' love it!! I loved the long shot of the three of them standing on the docks as the boat sails off!! 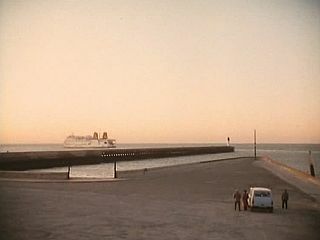 I agree, that shot as the last ferry sails off is fantastic. I was there last summer and this is a far up and across as I could get without falling into the sea as there was construction taking place and I got some very funny looks from the holidaymakers while I was there too. The sunset and empty feel of the original is so much better than the more recent shot. They do a cracking bag of chips (not ships!) there. My local football team played away to Caais in a friendly in July 2013 and it was quite shocking the amount of people on the coach who actually could recall that episode of Minder! Even better was when we got to the football stadium and the amount of people who rewarded me in beer, for ordering the beers for them in French at the bar! If only my French great grandfather ARTOIS, who brought the name ARTHUR into my family, could have seen me then! Great stuff yoyo! 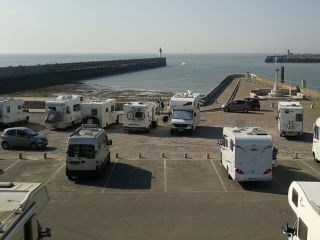 One day myself and le yoyo pick-elles will have to meet in Calais to sample 'Artois et le Minder locationnes!' - the 'Minder On The Orient Express' locations are all really close by too. I have searched high & low for Henry's garage from this episode (the only one missing), driven up and down the canal to Guînes and back trying to find it but no luck. Also traced the location managers and art director and enquired there but alas, 'not a saucisse'. The only way is going to be through French business data I reckon, major agg! I'm back again this year so will have to brush up on my 'Je m'appelle Raymondo' in order to ask the locals where it might be/might have been as I think it has probably bitten le dust. At the moment I can only offer a shot of Madelaine's café - the very kind owner was very interested in the shop's past and let me take a photo. I gave this a watch this morning and it is a cracker of an episode, a real cracker, very funny. Dave is prominent throughout, which is always great, one of the best characters in any TV series and his devotion to Arthur is touching. Some great lines throughout, with my favourite being when Arthur quoted Kennedy..."Ich bin ein Binliner" Arthur also getting his plates of meat under the table at Madelines Cafe was nice also, pity we couldn't have had a return to this storyline on a later episode. I have been to Calais 3 times and am familiar with a few of the locations, I have even been in one of the cafes which we see. We also missed our ferry because I never changed the time on my watch the first time! The second time we were on foot and got lost in the harbour area for over an hour and never saw a single soul to help us find our way again, how times have changed in Calais...We missed that ferry too! "What's French for en suite facilities?" comedy gold. Great, great episode. From the 1956 film 'It's a Wonderful World', coming soon to 'Not Minder'. Actress Mylène Demongeot was known as Mylène Nicole back then. Another great episode. It's a fun change of pace to see Arthur and Ray away from the manor and it's good to see Dave have a larger role ithan usual. Lot of fine moments through out the episode. Arthur in the French jail is a series high point! Every time I visit Calais I can't help but think of this episode. It seems to be so representative of what I remember from the 90s - people harping on about French booze cruises and this is a top top episode you can return to time and time again. I challenge anyone who goes to Calais and visits a location from the episode, not to think they have somehow arrived in Minder heaven. I ťhink everyone who has a fondness for this episode has to go to at least one of them for a visit. As I sat and took this photo below, I was transported right back to this episode and 1993 ... absolute magic. It makes me laugh seeing Dave and Ray at this cafe, as in the previous scene they had left in the wrong direction to get there! In fairness yoyo, I have taken a few wrong turns in Calais myself trying to find these places. I've had no luck at all finding Henry's garage after driving about looking for it. Neither the location manager nor the art director both of whom I have tracked down and asked have been unable to help out. The name 'Garage Du Canal' suggests the canal somewhere but until some paperwork turns up this is a lost one (for now). Driving instructor: "The life jacket says Italian Navy?" Arthur: "It's one up from Royal Blue!" Very funny dialogue. Peters out a bit towards the end. I must visit Southend Pier one day and do the walk. Oh, I wondered what she meant in the cafe. Clever! I liked the episode because it was set in France. As other brothers have already stated, this is right at the top of the best episodes. Booze cruises or booze runs where all the rage then and brings back memories for most. Not a bad episode. I quite enjoyed it. Coincidentally, this was repeated on ITV4 the same day the booze price hike up here in Scotland as I have been reading that Scots may travel the border to England for cheaper booze. It's showing now on ITV4..! Funny thing is, the aussie dvd has a picture in the extras section, of Arthur, Ray and Dave at the restaurant on the ferry, George Cole is the Arthur clothes, and as in the episode Arthur says "we have had morning solid to eat since the ferry" makes me wonder if that was a reference to that (maybe cut) scene?